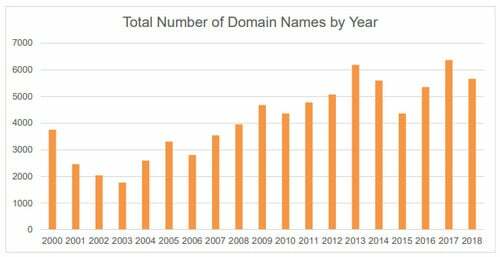 Filings up but number of domains down at largest UDRP organization. WIPO heard 3,447 cybersquatting cases covering 5,655 domains in 2018. Chart courtesy WIPO. World Intellectual Property Organization (WIPO) has issued its annual release about how many cybersquatting cases it heard under UDRP and similar policies. WIPO’s headline says it’s a record, and that’s true when considering the number of cases (3,447). But the number of domains involved (5,665) was only the third highest (see chart). Another thing to point out is that there will be a lot of false headlines saying that cybersquatting has hit a new high. Remember that WIPO is just one of the providers for UDRP. It has tended to win more market share over time. Also, case filings do not necessarily correlate to the amount of cybersquatting. I expect UDRP filings to increase in 2019 because of GDPR. Companies that question whether a domain constitutes cybersquatting have difficulty figuring out if the registrant has rights or legitimate interests in the domain because they can’t research the registrant. They might be dissuaded from filing a complaint depending on who the owner is. Of the 5,665 domains, 5022 were gTLDs and 633 were ccTLDs. .Com, .Net and .Org were unsurprisingly the top gTLDs. .Nl, .Co and .Se led the way for ccTLDs. According to RDNH.com, there were 28 reverse domain name hijacking findings at WIPO last year. Guest Article: How Do I Become a UDRP Arbitration Panelist?